"Expect me like you expect Jesus to come back expect me I'm coming." On the night of September 7th,1996 Las Vegas was operating at full capacity.Thousands had gathered for the heavyweight boxing match between Mike Tyson and Bruce Seldon, held at the famous MGM Grand Hotel. Tupac Shakur was one of the many celebrities who attented the fight. He was accompanied by Marion "Suge" Knight, CEO of Death Row Records, Shakur's recording company. Tupac went backstage at 8:45pm after fight hugged Tyson and then headed to lobby of hotel with crew. This is where the fight started between Tupac and Orlando Anderson.A security camera recorded the incident on tape. The fight was stopped by hotel security, and Orlando was held for questioning by the police, then was allowed to leave after he declined to press charges. 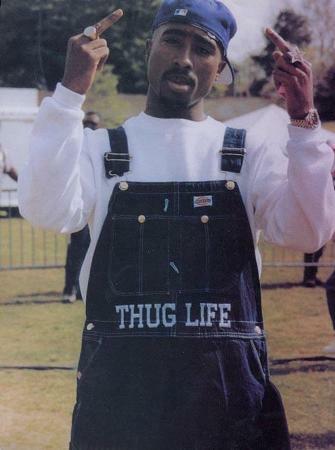 Tupac got ready for the party at Club 662, where 2Pac was going to perform. He had wanted to drive his Hummer, but Suge said that they had things to discuss and got Tupac to ride with him. Two hours later, Suge in his black, tinted-window �96 BMW 750 sedan left the mansion with Tupac in the passenger seat, and the 10-car entourage behind them. They were listening to The Don Killuminati The 7 Day Theory very loud in the BMW. At 10:55, Tupac rolled down the window and a photographer took their picture at a red light(the last picture taken). At 11:00, they were stopped on Las Vegas Blvd. by Metro bicycle cops for playing his car stereo too loud and for not having license plates, which were in the trunk on his rented car. He was not cited and was released a few minutes later.At a red light, on Flamingo Road, near the intersection of Koval Lane, in front of the Maxim Hotel two girls distracted Tupac and Suge on the driver�s side, and at 11:15, a white, four-door, late-model, Cadillac with California plates pulled up. Tupac had been standing up through the sunroof. Two of the four men inside the car got out and fired thirteen rounds into the passenger side of the car, from a Glock .40 caliber handgun. He tried to get into the backseat, but Suge pulled him down, and a bullet bounced off of his right hip bone and hit is lung. He was also hit in his right hand and chest. Suge was barely hit by a bullet, and suffered a minor head wound. Immediately after the shooting, the Cadillac went south on Koval. Suge Knight made a u turn and drove away from the nearest hospital. 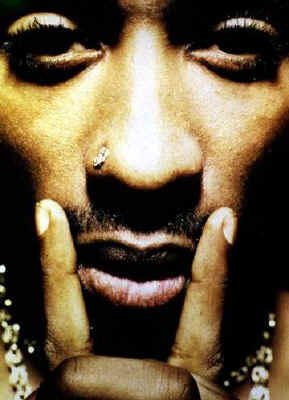 When the car finally stopped with 2 flat tires Tupac was taken to the University of Nevada Medical Center by ambulance. Tupac lost 22 oz of blood on the way to the hospital.Tupac was admitted and listed in critical condition. His injuries included a gunshot wound to his right chest,a gunshot wound to the right thigh with the bullet within the abdomen,and a gunshot wound to a right finger with a fracture. 19 year old Yafeu Fula (Kadafi ~ a member of the outlaws) had been in the car behind the BMW with bodyguards. He told the police that he could do a photo lineup and gave them his number. Yet they police never contacted him and he was the only witness willing to cooperate. Why did the detectives let Fula leave Las Vegas without questioning him? Las Vegas is a pay off city could have everyone been in on the death? Doctors, press, lawyers, etc. How did the White Cadillac carrying the shooters just disapprear in the middle of the desert? 8:39pm: Mike Tyson knocks out Bruce Seldon at the MGM Grand Hotel. 8:45pm: As Tupac Shakur leaves the MGM Grand, he gets into an altercation with a young black man believed to be Orlando Anderson, member of a rival gang, The Southside Crips. MGM security video catches the incident on tape. The fight is stopped by security. A man involved in the fight with Shakur is held for questioning and then let go. Anderson doesn't press any charges. 8:55pm: The Death Row entourage leaves the MGM Grand and stops by the Luxor Hotel on the Las Vegas Strip for reasons not known, then proceeds to Suge Knight's house southeast of downtown. Time Unknown: The 10-car Death Row entourage leaves the mansion in route to Suge Knight's Club 662, located about 10 blocks east of the Las Vegas Strip at 1700 E. Flamingo Road. Shakur and Knight ride in his black BMW 750. Around 10:55pm: Tupac rolls down the passenger side window to allow someone to take a photo at a red light. The famous "last photo taken" is now snapped ~ see below . Around 11:10pm: The BMW is stopped by bicycle police on the Las Vegas strip for not having a license plate on the car (the plates are in the trunk) and for playing music too loud. No ticket is issued. Around 11:15pm: On Flamingo Road, near the intersection of Koval Lane, a white 4-door cadillac with California plates rolls up to the passenger side of the BMW. According to one witness, two men got out of the Cadillac and fire 13 rounds from a Glock .40 caliber handgun at the BMW from less than 13 feet away. According to the witness, Shakur attempts to jump into the back seat of the car as he is being shot but Suge pulls him down into the seat. Two tires are punctured in the barrage of gunfire. Suge Knight makes a U-turn on Flamingo, races west to Las Vegas Boulevard, makes a left turn. After encountering heavy traffic on the strip Knight's car hits the median blowing out a third tire and comes to a stop near the intersection of Harmon Avenue. 11:16 - 11:20pm: Up to 20 police officers arrive at the scene of the accident. Around 11:30pm: An ambulance arrives and whisks Shakur and Knight to University Medical Center. As Tupac is being removed from the vehicle he repeats, "I can't breathe, I can't breathe." Tupac didn't even want to go to the Mike Tyson fight yet Suge pressed him to be there. WHY SUGE? Why was it so important for Tupac to be at that fight in Vegas that night? Suge was late arriving to the fight and he and Tupac entered the fight during the National Anthem. The Tyson fight only lasted 1:09 seconds. George Kalesis had a meeting at his house with Tupac's security "Wright Security" Reggie Wright, Michael Moore, and Frank Alexander before the Tyson fight and they were all informed not to carry any type of weapons or phones ? Orlando Anderson was at the Mike Tyson fight in the lobby but couldn't get into the fight for some unknown reason but waited in the lobby for people coming out. Trevon Lane who is assocaiated with Death Row and Suge Knight was the one who ran over to Pac and whispered something in his ear that caused him to take off running after Orlando Anderson. Trevon Lane was the guy who was in the Lakewood Mall in a Footlocker when his Death Row emblem was snatched by Orlando Anderson. Trevon Lane getting his Death Row Chain snatched by Orlando Anderson. Orlando Anderson being in the lobby of the fight just hanging waiting? LOOKS STAGED ~ The entire night we even have a patsy in Orlando Anderson. Lead car was usually driven by Suge Knight but not on the night of September 6th, 1996. 2) Car # 2: Tupac Shakur and Suge Knight. 3) Car # 3: Trevon Lane ~ To the immediate left of Tupac and Knight. 4) Car # 4: Unidentified car full of women behind Trevon Lane's vehicle. 5) Car # 5: White Cadillac with Shooter ~ To the immediate right of the BMW. 6) Car # 6: Frank Alexander and The Outlawz ~ Directly behind the BMW. From the DVD "Tupac Assassination"
A 14th century teacher once said "The Simplest Explanation is the best one" this may be the case except for the case of Tupac Shakur. 1) Take out communications ~ Isolate any help. 3) Give the victim false sense of security. 4) Make the shooting appear like a random act. 5) Eliminate the Assassin / Witnesses.